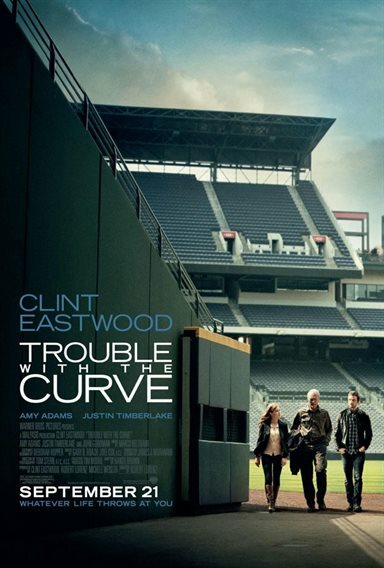 Download Trouble With the Curve in Digital HD from the iTunes store. Trouble With the Curve images are © Warner Bros.. All Rights Reserved. An enjoyable life drama Trouble with the Curve opens in theaters nationwide with a stellar cast playing likeable characters in this modern day sports story. Drawing on an age old message concerning separated family members the film should hit a home run with those who have been dealing with the problem and need a nudge toward reconciliation. The film centers on Gus Lobel (Clint Eastwood) an older man beyond normal retirement who still has his feet in baseball as a long time scout for the Atlanta Braves. A star in his field he travels to high school ball parks to get first hand looks at the talent that may sometime become baseball greats. With his eyes not being what they used to however, he has been relying on his other senses to reassure he's making the right decisions. With the baseball draft coming up and assigned to follow the top batting prospect Bo Gentry (Joe Massingill), Gus finds himself not up to par. This getting noticed by his friend and immediate superior Pete Klien (John Goodman) he calls Gus's estranged daughter Mickey (Amy Adams) to let her know that her dad is being evaluated on his assessment of Gentry. At first she doesn't want to square off with the man who gave her away to an uncle after the death of her mother so he could keep traveling on his job, yet she calls Gus to feel out the situation. She realizes that the circumstances may escalate in a negative way with his job so Mickey takes a chance on going to see him. Mickey proposes a deal of her helping him without reconciliation and Gus agrees. When Gus realizes how much he has missed being in her life, he decides to fess up with the truth. The acting here makes for a very enjoyable movie with Eastwood showing he still has it as the master of artistic drama. Making his Gus a stubborn man who evades getting to the truth of his separation from his daughter, he moves the sympathy to Mickey. In his loneliness he visits his wife's grave weeping for not only that loss but also of a daughter who he alienated. Adams puts together a nice performance making Mickey strong in her convictions, but still hurting inside looking for answers to her father's rebuke when she was very young. In Trouble with the Curve she takes a lot of swings at the elusive man, but in the end it's that one pitch that decides the final score between love and truth. Justin Timberlake does a good job playing rival Scout Johnny Flanagan who got his pitching start in the big leagues due to Gus's choice in a draft. He's also scouting Gentry and the two find a competitive edge in not only choosing baseball talent but Johnny's intentions after meeting Mickey. Timberlake keeps his character distant, but when it comes to wanting a relationship with Mickey he's all about getting to first base. 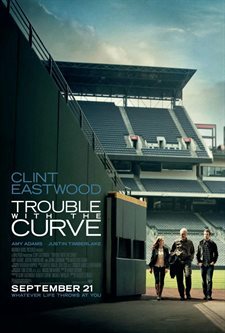 The directing by Co-Producer Robert Lorenz and Eastwood's long time business partner works well with Trouble with the Curve. It's hard to break the mold so I'm sure he allowed Eastwood to direct himself with even allowing him to give a few pointers on the acting of the rest of the cast. But at the end of the day, it's Lorenz who takes the bows for this nice piece of life brought to the screen in a worthy package. Even with the fine acting and direction the story has a bump in the road to being completely realistic. No matter what the reason for Gus and Mickey's separation, there's a gap of understanding as why they didn't reconnect when she reached her college years. No matter what the reason for Gus and Mickey's separation, there's a gap of understanding as why they didn't reconnect when she reached her college years. This bothers my somewhat because the secret kept from Mickey is something with which the two could have dealt. This being the only negative point, putting it aside the movie's certainly likeable and the message rings clear. Trouble with the Curve has been rated PG-13 by the MPAA for language, sexual references, some thematic material and smoking.